Welcome to a no-frills home page, one small corner staked out online through a few comments on a few things I'm interested in. Multi-purpose journal: Different thoughts on these and other topics (with a mirror). 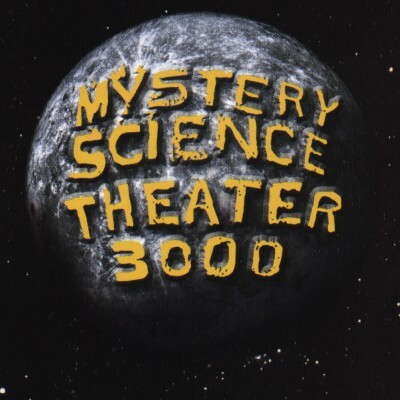 Trying to find a brief yet snappy way to describe it, I juggled thoughts like "some of the funniest heckling ever" and "that show with the robots and the cheesy movies" only to wind up thinking the best way to get know what Mystery Science Theater 3000 is is to just watch some of it. Nowadays, that's as simple as searching for video clips, but back when I first heard about it I was in a different country with no way to see it... and yet, there was still something ready to hand online in its fanworks or MSTings. Even as I was coming to question that, however, I was managing to see a first few episodes of the series itself. At first, I might have just been contrasting the often lengthy and involved comments of MSTing, text dropped into more text, with the quicker quips that had to be squeezed in among the dialogue of even the slowest movie. Then, as I began to watch a lot more of the series through a variety of methods, I began to think that perhaps the show let movies speak for themselves in a certain way, that even those cheesy movies had their own unexpected way of entertaining, and that Mystery Science Theater 3000 didn't have to be a bulwark at once against and above a mass culture rejected as a whole. As I was coming to think that, though, the MSTing community was dwindling away. The show was off the air, and some had already gone from trying to tell the further stories of its characters to tossing together new crews of random commentators. These "non-standard MSTings" might have fragmented the audience, and in some of those smaller circles the cheerful subtleties of the show might have faded away. Then, in the end, the oldest and most respectable archive of MSTings turned out to have been run by just one person, who had burned out by degrees on the subtle challenges of archiving fanfiction. One day, he took his archive down while moving, and never put it back up again. Even so, the series remained to be turned to in full, and is accessible nowadays in ways hardly imaginable in the days when I was reading MSTings. Some old MSTings can still be found too, one small part of a larger experience. The MSTing Mine: a list of links to MSTings. These are some of my favourite MSTings. These are some of the MSTings I've written or helped to write. Thoughts on Mystery Science Theater 3000 episodes. Satellite News is a central source of information and discussion for fans, and offers a brief history of the show complemented by the MST3K Temple's heavily illustrated chronicle. A number of people have put together their opinions of the series at sites like Mighty Jack's MST3K Review, the Colossal MST3K Fan Guide, and Andrew's MST3K Review; I find the MST3K Chronocinethon interesting because I saw it being put together in production order. The numerous references made in each episode begin to be explained at The Annotated MST, the Distributed Annotation Project, and Too Much Information. There are still some small, mostly personal MSTing pages around such as MSTing Heaven, Jim Gadfly's MSTing Page, and A MSTing For All Seasons. The Stephen Ratliff MSTing Archive takes on the fanfiction of one author who took a minor character from one episode of Star Trek: The Next Generation and raised her to contrived heights, and over time reached a strange, amiable coexistence with the people "riffing" on his work. The Vault of Anime MSTings is one of the largest archives still extant, and as its name suggests concentrates on anime fanfiction. Its authors, though, also grew to concentrate on "non-standard MSTings," which may make them that much harder to get into if you don't share much the same interests as their authors. Through the site, though, I did find authors I shared many of the same interests with, the prolific Elmer Studios, who have got back to work in recent years. At the beginning of the 1980s, my family had a microcomputer in the home, and at an early age I was learning to use it, loading low-resolution monochrome games off tape and starting into BASIC programming tutorials (at least until I would get bored with them and give up partway through). As the decade rolled on and we kept upgrading, the games became more colourful and the applications more interesting, but I never quite seemed to realise there were other kinds of computers around until all of a sudden things had changed and everyone else had a boxy PC clone in their house. Then, at the beginning of the 1990s, I found some old computer magazines at high school and in our basement and began to learn about things past. As computers at home began linking into much larger networks, I managed to turn up still more connections, from emulator programs to file archives to scanned magazines, to the days I had lived through without quite experiencing in full. Aware of how it all ended up, the dark side to this can sometimes seem to be know-it-all comments reducing everything to a series of stupid and obvious mistakes made by everyone but Bill Gates. Even with that, though, there's still a feeling in the history of potential, variety, and new possibilities. Some of the games I played were adventures, where I would type in what I wanted to do and read what happened. After a while, some of those games started showing me where I was with pictures, but ones where I could type in more than two words at a time stood out too. One of those games came in a fancy box with a catalog included promising other games like it, not just "text adventures" but the "interactive fiction" of Infocom. By the time I'd found enough hints to be able to play to the end of that game, though, text-based interactive fiction didn't seem to be around any more. When I started going online not that many years after that, though, I learned almost at once that there were people who remembered those games well enough to have developed software that let them write their own games much like it. I suppose the simple existence of the interactive fiction community matters a little more to me than playing through all of its games, but it's still another thing to be interested in. 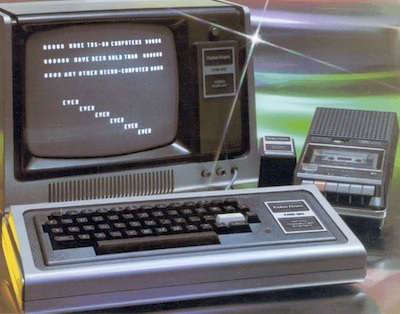 Various interactive fiction weblogs are aggregated at Planet IF; among them, The Digital Antiquarian is working on a history not just of "adventure games" but of personal computing as developed from it. The Interactive Fiction Database provides information and user-supplied comments on works of interactive fiction. SPAG magazine has also long provided reviews of those games. 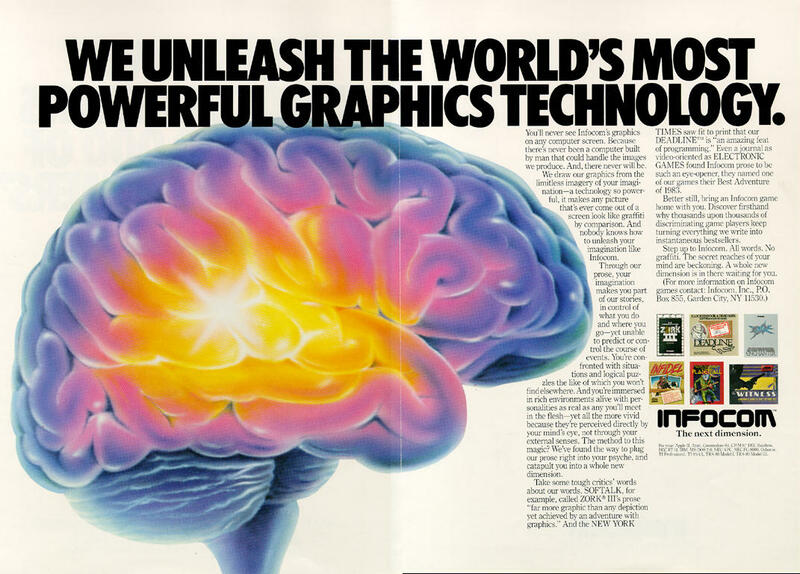 While Infocom's adventures put text on computer screens, they also had a visual presence through their packaging; scans of the boxes and manuals can be found at the Infocom Gallery and in the Museum of Computer Adventure Game History's Infocom Gallery. It came along later, when it seemed everything had changed, but there are things about Marathon that link it to those earlier days for me. Although the very simplest description of it might be "a game like Doom," just one written for the Macintosh by Bungie Software and beating ports of comparable complexity to its target market, there are subtleties to this game different from the visceral legend of Doom. One of these is the computer terminals logged into throughout the game, at first just mission briefings but building into a complex and long-discussed story. The Marathon games are available for modern systems through the open-source development of the game engine. The story told throughout these games has long been analysed at the Marathon's Story site, with some discussion continuing on its dedicated forum. Some of the popular third-party scenarios created to be played with the game engine do seem to lack something compared to the complexity of the official story, but I've found the stories of Marathon Rubicon and Tempus Irae interesting in their own ways as part of a full game experience. Among all the "Saturday morning" cartoons I saw in the middle of the 1980s (and I watched a lot), Robotech got my attention. Part of that, though, might have been the challenge of its serial story, one I'd first dropped into partway through on vacation at my grandmother's (who had cable). Piecing together just what was happening with all the interesting transforming machinery kept me watching on each vacation that followed, until one day over two years later when I saw genuine novelizations at a school book sale, just in time too with the show going off the air. One decade turned into another, a "state of the art" began to return to animation on TV just as I was getting a little pickier about it, and I was still interested in Robotech's story, helped along by the novelizations and pictures of some of the machinery in a role playing game book, remembering it as the standout of an era now passed. Rather slower than some people, though, I was figuring out the show hadn't just been one very different cartoon from that undefined place all cartoons came from, but had been formed from three separate animated series all the way from Japan, Macross, Southern Cross, and Mospeada. Then, I learned there were more shows like them called anime, and some of them were even starting to be sold on videotape over here. I didn't quite have the cash or the courage to seek them out in high school, though. Then, right after graduating from there, I first went online and wondered almost at once if anyone had put any information on Robotech there even with the feeling creeping up on me I "ought" to be getting beyond its novels. There was indeed information online, and even a mailing list. As soon as we had email set up, I joined the list. It was a bit of a shock. The people on the list were saying a great deal about the novelizations and the role-playing games, and a great deal of that was about them not being an accurate depiction of the original show, at least in the rigorous and almost realistic technical way they interpreted it. As much as seeing things their way meant adjustment, though, it still appealed to me more than another new perspective being pushed at me. When I went to university, I saw posters there for its anime club. 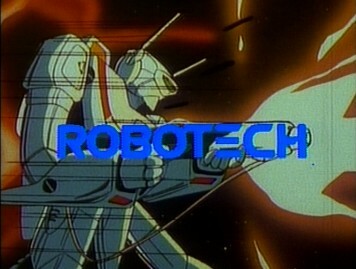 As I starting going to it, taking in general information about anime online made me run into how for some Robotech remained the single most controversial cartoon of the 1980s, not because of violence or merchandising but just for the particular circumstances of its assembly, the original music and names of its three components changed. I managed to tell myself Robotech could still be looked at with kindness by applying historical perspective and calling it "good for its time." Even with all of that, I was taking in different kinds of shows at the anime club, getting a bit more comfortable with the shock values of "cartoons that weren't for kids," moving beyond science fiction and the fantastic, and picking up on the common terms of reference. Graduating from university with a solid interest in anime added to the continuing search for animation compelling to me even if just ready to hand, I looked forward to making enough money to afford it myself even as I managed to see every episode of Robotech at last, but as that happened I was getting annoyed with the continuing arguments over whether its licensed products were that distant from particular interpretations of the show after all and dropping away from the discussion. 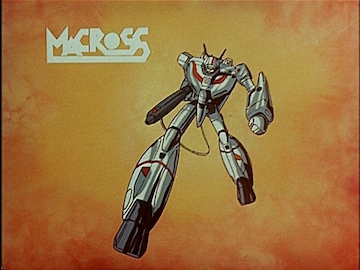 Then, the three component series were released over here with their Japanese language subtitled, and now able to afford them I concluded there were times Robotech's dialogue inverted what had been shown in the animation and times the translation had been accurate enough to contradict what the spinoffs had later tried to say. I could still apply historical perspective to the show but might have drifted, without any conscious thought of it, back to something like what I'd already spent years doing, remembering and contemplating the show as an undeniable part of my makeup without actually watching it. In any case, I was now buying anime series faster than I could watch them with a sort of "I can always watch them someday so long as I have them now" feeling, getting over the worry I might somehow lose touch with it like certain people complaining online, adapting to what was in some ways changing and in other ways still very familiar, and taking an odd sort of satisfaction in my longevity as a not altogether serious fan. From someone who'd watched Robotech without really thinking it looked different from shows designed on this side of the Pacific, much less registering the differences in style of its three components, I can now acknowledge I watch anime in part just because I like the varied ways it looks. New perspectives on Robotech often seemed to turn up right when I needed them to keep up my interest in it, and the official Robotech site was one of them. The discussion on its message board may never have been really profound, though, and it's a lot slower today than it once was. My attachment to it may also have been dented by a prolonged argument there over how it had abandoned the spinoffs and adopted the new viewpoint of the Robotech Reference Guide, the final expression of the oft-refined and revised interpretations of some people on the Robotech mailing list, dry and meant to explain never-completed works of fanfiction, but interesting in a technical way. The now-preserved role-playing game supplement Third Invid War, however, may show there were other alternative viewpoints as well. There are even a few recently updated chronicles such as Robotech Visions and This Robotech Thing, by someone who's long been making efforts to chronicle the Robotech comics. Anime News Network has been around for a long time. Its community, led by many of its feature writers, can have a critical and perhaps even narrow view of what anime appeals to it, but it does help you know what's going on. For different perspectives on some titles, you could check the also long-lived THEM Anime Reviews or The Anime Review; for much less accurate but perhaps funnier news, you could check Anime Maru. One factor in the longevity of my own fandom, though, may be the different community that began on the "Anime on DVD" message boards and has lasted through several moves to The Fandom Post. While its own critical eye is turned to domestic anime releases, this might help the positivity people on it have towards modern anime. The Golden Ani-Versary of Anime covers notable titles year by year; it can get opinionated as well, but may serve as an introduction to independent anime weblogs. Through simple longevity and a general evenness of disposition, I've followed Omonomono and Ogiue Maniax for a good while; while their own dispositions may not be for everyone (each for a different reason), I'm beginning to find something interesting about Beneath the Tangles and Fantastic Memes. More perspectives may be found at Ganriki and Otaku Journalist. I was part of that generation, favoured or self-favoured, that first saw the movie Star Wars in a theatre at a young and impressionable age, but only just: when I was taken to a re-release, The Empire Strikes Back was already around. I didn't go to see that second movie, though, and while I knew Return of the Jedi was about to arrive just a little later, going to see it never quite came up either. I made do instead with storybooks and comics and novelizations, and they seemed good enough until my family had all three movies videotaped off TV, completing things in a sense with new spinoffs not showing up any more. Then, as a new decade got under way, more novels and comics began showing up, and when I had the chance some years later to see what other people were saying about all of it online I took it. It didn't take long, though, until I didn't quite seem to fit in there. When I saw some novels held up and others cast low for not acknowledging those best examples, to me the distinctions didn't feel as sharp; when the three movies themselves were divided the same way, it started feeling somehow unsatisfying to identify and dwell on disappointments; when Star Wars as a whole seemed to be seen as a force of Rebels battling the mass of the Empire, that just seemed not that different from a whole swathe of science fiction. With all of that, though, there was something bigger and getting closer to wonder and worry about. I might have never had the chance to form uninfluenced opinions about The Phantom Menace. In the last days before the first new Star Wars movie in years opened, the advance reaction to some broad comedy relief already seemed so violent I was sort of braced through opening night for some single moment that would offend me too, but it never arrived. My pleased relief lasted only until I started to get the feeling the negative frenzy was swallowing up everything else in the movie in the same hostile glare, and when that just didn't seem worth joining I started to feel very alone indeed. The sour condemnation always stumbled over when I wasn't expecting it cast a chill on how I reacted to the last wave of new MSTings and even left me a little glad Mystery Science Theater 3000 itself had ended just when it did; years later it would also keep me from taking in the new projects of the people who'd made the show. It might have distanced me from a lot of other science fiction and live-action movies raised sky-high in comparison, and it definitely finished the process of drawing back from the Star Wars novels when they also became something else to be held up. Then, the exact same swallowing seemed to happen with Attack of the Clones three years later, and the noisy nostalgia clung to, now seeming just a veneration of some visual designs projected on and old special effects, just kept feeling shallower. In that darkest hour, though, I found the courage at last to look a bit further into the works of one fan who'd seemed to be positive about what the first new movie had added to the story, and happened on a small community of fans also staying positive. Jumping in, I found my focus shifting back to where it might have been to begin with, with the main characters. Accepting that the story of the movies was the story of someone whose power and attachments together had led him astray and destroyed him only to be saved at last by the new outlook of his son, an illustration of larger common themes rather than just one specific war or even adventure, seemed at last and in time for Revenge of the Sith to give all six movies together some weight worth at least some of all the attention heaped on them over the years. It might have also made them seem self-contained in a way that can keep me detached from new promises of even newer Star Wars movies, but that's another question for another time. The Star Wars Prequel Appreciation Society is what it says it is, and it's something I agree with. The site is a nucleus of sorts for several other like-minded ones, including The Star Wars Heresies (the author of which has published a book with the same title). Star Wars Verses provides visual arguments for how to see a story told in large part through its visuals as one unified whole, and Prequel Frames offers a different visual focus. Star Wars Origins looks at some of the numerous movies and books suggested as having influenced the saga with the aim of showing how it blends into a whole. If you want a different and detailed take on putting things together, you could take a look at the Star Wars Ring Theory.